The Dunlop Blackstorm Titanium racketball racket features a one-piece construction for superb playability. It is engineered out of a Carbon / Titanium alloy making it lightweight yet extremely durable. 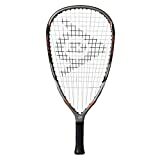 The racket utilises a 16 x 18 Powermax string pattern for superb power and spin. The racket is supplied with head cover.